Recently I was asked by a journalist to define the term mamachari. That's a good question that left me scratching my head as mamachari isn't easy to define in a few lines of text. First up the word mamachari is a typical Japanese mash up of the words mama, meaning mother and chari, a less polite word for bicycle. The mamachari is a cultural icon, it's the Japanese equivalent of the family station wagon. Its the family workhorse used on shopping runs, for riding to the local station, taking the kids to school or picking them up from sports practice. Without it families around the country would be in a right pickle. The defining features include, a top tube bent low that is easy to step over, a shopping basket on the front, a luggage rack on the back, mudguards, chain guards, dynamo lights, an integrated lock, a bell and a hefty rear stand that keeps the bike stable and upright when parked. Oh, I forgot, one of the most defining features of the mamachari which is brakes that go "SCREEEEEEEEEEEECH!" when even slightly feathered, startling everyone within earshot. After purchasing a mamachari, the upgrade of choice is a child seat. These can be mounted on the rear luggage rack or behind/between/in front of the handlebars. It's not unusual for a mamachari to sport two child seats, and on occasion you'll spot one with three! 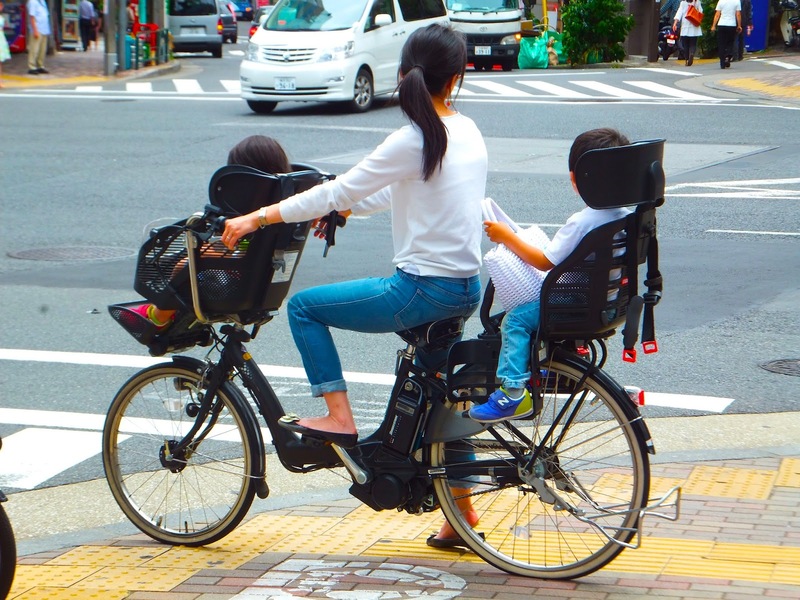 When the government implemented a ban recently on carrying two children on a mamachari mothers across Japan campaigned against the ruling and the government was forced to back down. Our mamachari is of a newer breed designed with passengers in mind from the beginning. The child seat at the front is mounted low between the handlebars for added stability and when not in use as a child seat it converts into a decent sized basket. But as children soon outgrow the front seat we've had to add a second child seat to the rear of the bike. Usually priced between Y10,000 and Y20,000 mamachari are essentially considered a disposable item. They're regularly left exposed to the elements for long periods of time, and for the most part are poorly maintained, even putting air in the tires seems a chore. Most people would throw a mamachari away or abandon it after years of neglect rather than undertaking simple preventative maintenance to extend the bikes useful life. 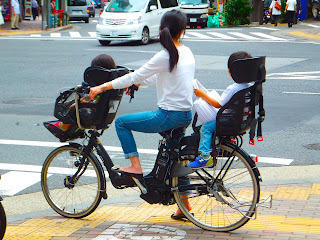 When buying a bicycle most Japanese don't consider anything other than a mamachari and initially I found this odd because when I think of bicycles I think recreation, mountain biking, commuting, racing, or for getting air off the top of a set of stairs. But in Japan I realized I'm in the minority, as even your average Japanese male purchases a bike for its utility, for making short trips to the station with a briefcase in the basket and carrying groceries home from the supermarket etc. In a country of 130 million people 85% own a bicycle. Who'd have guessed that the majority use their bikes for practical purposes rather than jumping gaps? Indeed, despite the fact I own 3 high end bicycles which are all incredibly fun to ride in their own way, when it comes time to pick up a 6 pack of beer or 5kg of rice from the supermarket my wife's mamachari is the most comfortable bike for the job. Why? Lights They're attached to the bike, difficult to steal and don't require batteries. Have to remember to bring them downstairs and attach them to the bike. Also have to remember to remove them when I arrive at the supermarket lest they get stolen, reattach them after I've finished shopping and remove them again once arriving home. Thats a lot of work. Basket Holds any amount of groceries I'm likely to buy in one go. Squash groceries into a backpack or hang them from the handlebars which not only interferes with the bikes balance, but is also frowned upon by the law. 5kg of rice? Impossible. For those of you saying "Well thats fine but you can't race a mamachari can you?" I'd like to direct your attention to the Mamachari Endurance Race held annually at the Tokachi International Speedway which attracts hundreds of participants and thousands of spectators all of whom enjoy the festival like atmosphere. Suffice to say its all just a little fun with few serious racers, but plenty of great costumes. So, despite the perceived un-coolness of the mamachari, it is by far the best bicycle for day to day use all over Japan and deserves a little more respect. The mamachari truly is the family station wagon of Japan, I don't know where we would be without it. If you're looking for a second hand mamachari at a good price in Tokyo try Suginami Green Cycle. can you purchase a mamachari in the U.S.? When I lived in Tokyo twenty years ago, we always called this a "babacharinko." Are there any online mama chari shops? I´m overseas and want to buy one. Can anyone help me? Thanks!